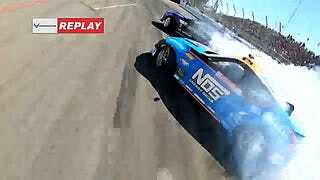 Formula Drift might not be for everyone, but holy hell do they get a lot of things right that other racing series can’t seem to wrap brains around. I attended last weekend’s Long Beach season-opening round and I was absolutely astonished by the incredible ways FD is adapting existing technology to its needs. Live drone footage from each run is an incredible way to bring the action directly into your face. By nature cars are mobile and stationary television cameras can only provide so much swing and pan. Even on a giant boom, that camera can only give you one corner of action. Plant the camera on a helicopter and you’ll get a full run worth of action, but the cost is astronomical and the pilot certainly can’t get within inches of the drivers without dozens leaving in body bags. With consumer grade video capture improving practically every two months, this kind of tech has actually existed for a little while now. Live streaming from an internet-attached action camera isn’t exactly new, but I can’t recall a time when the producer has thrown to one as part of the programming repertoire. I did see the little drone ripping around the track during most of the runs, and it was awesome to see that same footage boosted directly to the trackside jumbotrons. I ended up leaving a little early on Saturday and watched the final handful of runs from my laptop in my hotel room. Not only was this live stream absolutely flawless and produced to the same level as any live television broadcast motorsport, they also used the drone footage directly in the live stream as well. IMSA, IndyCar, Formula One, and others could learn a thing or two from Formula Drift. This drone footage rules so much. I want more of it.